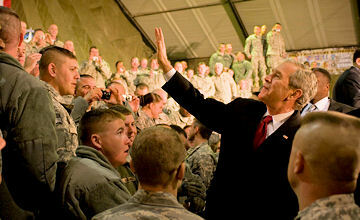 President George W. Bush waves to military members at Bagram Airfield, Afghanistan, Dec. 15, 2008. (Air Force photo by Staff Sgt. Samuel Morse) WASHINGTON, Dec. 17, 2008 – The day the Iraqi people voted for the first time in their history, and the day U.S. forces captured Saddam Hussein were "great days," according to President George W. Bush. In fact, he said they were two of his greatest days in office. The 43rd president shared his perspective on the last eight years as the nation's commander in chief during a Dec. 11 interview with the Pentagon Channel's Air Force Master Sgt. Rusty Barfield. Following the terrorist attacks on Sept. 11, 2001, Bush said, he went from being a president dealing with tax cuts and education reform to being a president in a time of war. "I vowed that day and the days afterward that I would not let this attack on America stand and that we would bring the killers to justice," he said. About a month later, Bush said, he concluded that taking out the Taliban and removing the terrorists' safe haven in Afghanistan was necessary for the security of the United States. He then called on the U.S. armed forces to "be ready," because the time had come for America to act. "The decision to send troops into harm's way is by far the most difficult decision for a president, because the consequences of war can lead to death -- people will die," he said. "I knew that it would be my duty -- as best as I possibly could -- to explain the mission. I knew it was my duty to make sure we put in everything to make sure we succeeded. And I knew in the aftermath that I would be dealing with some grief." In 2003, the second phase of the war on terror began after Iraqi dictator Saddam Hussein refused to leave Iraq. Bush said he was deeply concerned that the man who defied the world, had sponsored terrorism and who already had used weapons of mass destruction would be a security threat to the United States. Although he hoped for a diplomatic solution, the president said, Hussein chose a different course. "I believe getting rid of Saddam Hussein was the right decision then; it's the right decision now," Bush said, "But I knew, however, that families would lose a loved one. That's always something that weighs heavily on my mind." "When the Iraqis went to vote, our troops from all branches ... helped this young democracy take a huge step on the path to stability,” he said. “For me, I don't take that much satisfaction personally from it, [but] I take a lot of satisfaction as a team member. Our military is a fabulous team, and I am so honored to be the commander in chief. When he leaves office, he said, "being the commander in chief of a group of fabulous people is what I'm going to miss the most." While supporting the troops always has been a priority, Bush said, he doesn't think the nation's commander in chief ever can pay enough attention to the troops and their families. "We have a volunteer army, and our troops must understand that the president honors them, believes in them and supports them," he said. A frequent visitor to Walter Reed Army Medical Center here, Bush said he wants the troops and their families to know the commander in chief is paying attention to the quality of care the wounded and injured are receiving, and more importantly, to the people who are being treated. He said visiting the wounded is an obligation he takes seriously. Bush said he ends up being comforted by seeing the compassionate care provided by doctors and nurses and by the troops themselves. "I get comforted by a soldier who looks me in the eye and says, 'No problem, Sir. I can't wait to heal up and go back in,'" he explained. "I get comforted by families who are so proud of the contribution that their loved one has made. They're by the bedside, obviously praying and hoping for the best recovery, but incredibly proud. It is a great experience to go to see these troops." Even though he can't "heal the hole in a family's heart" of those who have lost a loved one, he said, "I can honor them and I can praise them. I can laugh with them. I can hug them, which I try to do a lot. "On my way out of office, I want them to know that I never made a decision regarding their loved one based upon what was good for a political party or my own political standing," he continued. "And that I believe strongly in the mission and I believe history will eventually understand the importance of the mission and the fact that their loved one sacrificed for peace." Bush said he learned much about how to lead the military by carefully watching his father, George H.W. Bush, when he served as the nation's 41st commander in chief. "I know his great respect for the generals that were close to him. I know he listened to them," he said. "He was a great commander in chief, because he -- first and foremost -- he holds the military in great regard and great respect." During his final visit to Iraq and Afghanistan on Dec. 14 and 15, Bush praised the military's accomplishments. During a town hall meeting at Bagram Airfield in Afghanistan, the president told the troops: "Thanks to you, the Taliban is gone from power. The al-Qaida training camps are closed, 25 million Iraqis are free and your loved ones are more secure."